Think of incense and you think of smoke, and churches, and heavy cloying fragrances. I happen to love a little incense, but rarely burn it at home, as it can lead to a bit of a muggy atmosphere. Flora, the latest incense release from Fornasetti is about as different from “traditional” incense as can be. Smelling delightfully of lily of the valley, tuberose, and jasmine, this really does smell like a country garden! Surprisingly, it also smells like a country garden whilst it’s burning. Fornasetti have spent two years trying to best get a delicate, airy and light scent into the incense format. and their hard work appears to have paid off in spades. They’re pretty powerful too, one stick perfumes our entire flat for hours, without feeling heavy or oppressive. 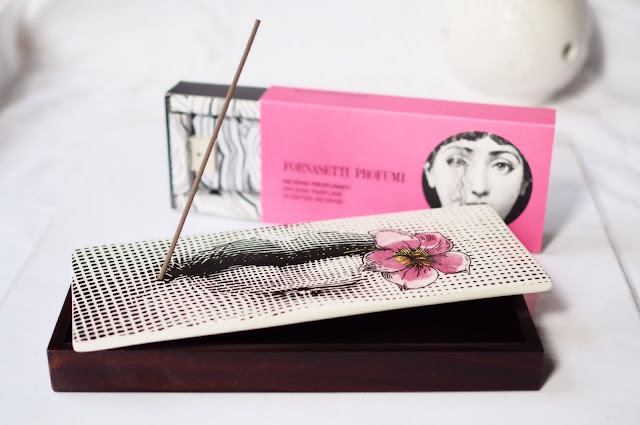 The Fornasetti Flora Incense box comes in three designs (the one shown is Flora di Bacio), and costs £145, but you can buy the incense alone for £45.